Do you want to work in the Capitol or Capital? Many people often confuse the two words; with one letter of difference, it's an easy mistake. Whether you want to work in the capitol building or capital city, you should know about the different types of capital, each of which has a unique impact on your life.Social CapitalYour network is your net worth. We have all heard this phrase or a variation of it, particularly if you are in the D.C. area, and it cannot be truer. Not only does knowing more people expand your available opportunities when searching for a job, it can also make you more valuable to the job you have now. If you can pick up the phone and completely bypass the chain of command, you will be invaluable.via GIPHYOne of the most common issues people run into is how to effectively build your social capital and expand it outside of the workplace. One thing you should remember is that everyone you want to have a connection with is a person too. They have (fairly) normal lives, going out to eat, shopping, to the park, so on and so forth. Meeting people at these places, outside the office, can help lead to a great network in the Capital.Human CapitalLiving in the Capital can be a change of pace for those not used to the D.C. scene. As someone coming from a small town in East Tennessee, it was certainly a change for me. One aspect of your capital that can be left on the back burner during this transition is your human capital.via GIPHYYour human capital is your health, and with all the great places to grab a bite to eat or get a drink, it can be easy to not pay this much mind! However, those couple nights out and networking lunches can catch up with you. To help with this, D.C. offers many ways to help with your day to day health, including parks, trails, health food stores, and too many gyms to choose from! Its also important for your human capital to get some adequate sleep; you should never fall asleep at your office because of that Capital night life!Financial CapitalIf there is one thing everyone living in D.C. can agree on, it's not cheap! With some of the highest rent and cost of living in the country, it can be easy to find yourself on a strapped budget. It's important to save money, but up in the Capital it can be hard to justify putting that capital back in the bank.via GIPHYThe little things can help make this a lot easier such as taking the metro or bus instead of Uber, or shopping at Trader Joes instead of Whole Foods. Sure, it might not be as glamorous, but the pay off will be when you're not worried about those plane tickets home or that anniversary with your significant other. Victory in politics is the direct result of the number and effectiveness of the activists behind it.This is one of the valuable lessons I took away from the Leadership Institute's flagship training, the Youth Leadership School, last November. It became clear to me that this is true, and the Leadership Institute is the best source to better understand political technology. This drove me to pursue an internship at the Leadership Institute.Like other interns at the Leadership Institute, I had read political books, assisted campaigns, and led a campus organization. But I knew the invaluable experience gained from the Leadership Institute would take my passion for advancing liberty to the next step and make me an effective leader in the movement.The professional skills, networking, and daily understanding of the most effective political technology means wherever my career takes me, LI has set me up with the confidence, skills, and knowledge to make liberty win.This semester's class is even bringing the expertise of LI to places across the globe. “I look forward to using my training in LI to help liberty flourish in my home country, Peru,” said development intern Javier Alban.The message of freedom is strong, and with the right training, conservatives can effectively make it a reality everywhere. If you would like to be part of the next generation of effective activists as a Leadership Institute intern, find out more about the program here. One of the most important tools for conservatives working together to advance sound principles worldwide is the International Democrat Union, or IDU. Founded in 1983 by America's Ronald Reagan, Britain's Margaret Thatcher and Germany's Helmut Kohl, the IDU is a global alliance of center-right political parties sharing a common commitment to the principles spelled out in the group's founding document, the London Declaration.While some may have felt the group's mission was accomplished with the West's victory in the Cold War and subsequent collapse of the Soviet Union, on closer examination it is clear that the need for conservatives to work together worldwide is as great as ever. While we have seen the spread of democracy in the 20th century, we have not automatically seen the uniform advancement of the center-right principles of free markets, individual liberty, and personal responsibility. Venezuela has worked to export "21st century socialism" throughout Latin America, for example, while Russia uses information warfare to cause problems within NATO nations, the EU, and the United States. Many more examples abound.Last week at the IDU's Party Leaders Meeting in Spain, the IDU took another step forward toward fulfilling its post-Cold War potential with the election of former Canadian Prime Minister Stephen Harper as President. Harper, a skilled and principled leader who understands how political parties work, is the latest addition to the IDU's new leadership team. Christian Kattner, the skilled political operative from Bavaria's CSU party (the more conservative sister party to Angela Merkel's CDU), came on board as Secretary General in 2014, setting the stage for the group's future growth.The IDU's greatest potential lies in serving as a dynamic forum for the exchange of ideas and best practices among center-right political parties, both in terms of policies as well as political campaign strategies and tactics. Last year at the IDU Campaign Managers Meeting in Berlin, I was introduced to numerous campaign leaders from a variety of countries including the UK, Norway, New Zealand, and a host of others. Each presentation provided insight into techniques, messages and methods used by the campaign teams of each of these parties to advance. It is a critically important function.With the continued strengthening of the IDU leadership team, I have great confidence we will see a further sharpening of the center-right parties that fully participate in this critically important organization.This article was originally posted on www.ronnehring.org/blog. Picture the scenario; you are an intern or junior staffer in the elevator of your work building, and a Vice President walks in… what do you do? Do you burst into tears, fall on your knees and beg for a job? Or do you seize the moment and deliver your elevator pitch? This brief but persuasive 20-second pitch is your chance to engage a potential employer in conversation in a confident but respectful way. By using this opportunity correctly, you can make a strong impression and turn them into a lasting connection. Here are some tips for your elevator pitch. Be natural. If you try to hero worship them, they won't take you seriously. Likewise, if you deliver the speech like you've been practicing it in the mirror, they won't take you seriously. Be respectful but confident. If you want a job working for them somewhere down the line, you have to earn their respect. A great way to do this is to bring up a topic of mutual interest. Perhaps you saw them speak, or read one of their articles. Draw from that to start a conversation. Instead of “Wow it's amazing to meet you, I'm a huge fan of… and I've always wanted to work there.” Try “Hi… my name is… and I work at… I attended your recent talk on… and you made some really interesting points.” Don't ask them for anything. Most executives are experienced enough to separate those legitimately interested in them and their organizations from the users simply trying to find their next job or promotion. Just like with any networking opportunity, the goal is to establish a relationship and then you can work on turning them into a connection. Be genuine and show a legitimate interest in them. By getting their business card, you can follow up and ask them for coffee later. Instead of: “I saw that there's a vacancy at… I'd like to apply; would you give the recruiter my resume?” Try: “How did you come to work in…? I am interested in pursuing a career in this field and would value any advice you have.” Let them talk. Most people enjoy talking about themselves, which can be both an advantage and a disadvantage. By letting someone talk about himself or herself, you are demonstrating a legitimate interest in them and allowing the conversation to flow naturally rather than simply pitching yourself. The disadvantage of this can be that by letting them do all the talking, you don't get the chance to impress. Try to establish a connection with what they're saying and something you have accomplished. For example, if they talk about public policy, try to contribute to the conversation and offer an informed opinion. Instead of: “That's interesting… yes… I understand.” Try: “That's a good point; I have recently been working on a similar project to…” Swap business cards and follow up. If possible, you should aim to swap business cards at the end of the conversation. Remember, it is more important to get their business card than it is to give them yours. By getting their card, you give yourself the opportunity to follow up and turn a chance encounter into a real connection. Instead of: “Here is my business card, if you're free for coffee sometime I'd love to learn more.” Try: “Do you have a business card on you? I would be very interested to follow up with you can continue this conversation at your convenience.” When chance encounters occur with your role models, it can be a daunting experience. If you show confidence, sell yourself, and show a legitimate interest, you will be able to use the opportunity to secure a lasting connection. When people think about blogs, they usually dismiss them as a prehistoric way of getting ideas into the public realm. Today many people prefer a 140-character tweet to a well thought out, self-published article that takes a lot of work to compose and publicize. However, when it comes to your career, demonstrating passion for your field is critical. Writing a blog, which is accessible to recruiters, could be what secures your next big opportunity. Here are 5 ways writing a blog can benefit your career. You can establish yourself as a thought leader Recruiters will expect to see that you have knowledge of your field and show an active interest. By writing a blog directly related to the professional area in which you want to progress, you can illustrate your interest and your ability to lead others. By communicating with readers in such a way that offers leadership, you are showing that you are a strong communicator and an innovative thinker. You can reach an audience directly Individuals who have not yet established themselves in their field do not interest most publishers. By writing your own blog, you cut out the intermediary and go directly to your chosen audience. When you write your blog, get your friends to share it, publish it on your social media and in relevant group chats, even tweet it to respected individuals in your field. That way you add validity to your work and show recruiters that readers respect your opinion. You have writing samples to show recruiters Good writers are in high demand, so not only will writing a blog refine your ability, but it will also give you examples of your writing you can show to recruiters. When you build your following and established people share your work, your blog posts gain validity as writing samples in job applications. In addition, by establishing a digital footprint you will have ‘Google Insurance.' This means that when a recruiter Googles your name they will see links to your blog. This shows you are engaged in the current trends of your industry and will significantly improve your likelihood of getting an interview. You can build a community of people interested in your field Building a following among your readers will get you noticed by others in your field. Taking an active role in the discussion will help you make connections. For example, if you are interested in foreign policy, blogging about it, and having your writing shared by those currently working in foreign affairs will get you noticed by potential recruiters. When you write a blog, remember to put links to your social media and personal website so readers and recruiters can find you easily. Your employer may value contributions Many employers in the conservative movement are looking for contributions to their websites and social media. By writing blog pieces you not only help your employer create content for their website and social media, but you also publish pieces through your organization which increases the validity of your writings. Successful workers take initiative. By writing a blog, you show employers you take an active interest in your work. If you have a significant following, use your blog to attract attention to your organization's successes. That way you can assist your employers beyond your day-to-day work. If you are interested in learning more about successful written communications for your career, please register for the Leadership Institute's Written Communications Workshop. You may notice a pattern every time you scroll your newsfeed. It starts with a relevant update, then an advertisement, and it doesn't take long before a video starts auto-playing. The biggest question on people's minds when they see this pattern is, “How do I get my content to appear first in everyone else's newsfeed?” Here are three things you can start doing now: 1. Go Live Creating a video is one of the quickest ways to grow your online presence and spread your message. Between 2015 and 2016, video consumption on Facebook increased 800% (from 1 billion views to 8 billion views per day). Now that's a big boost. Making things even better, Facebook gives precedence to videos over other pieces of content. Facebook even sends push notifications when friends “go live.” It's very easy to use Facebook live. You just update your status as usual, click “Live Video”, make sure everything is ready in preview, and click “Go Live” (pro tip: get a stabilizer for your iPhone or camera and a microphone for less than $35). Even if you're camera-shy, Facebook Live can still be for you. You can create live Facebook polls very easily with free sites like MyLivePolls. Then ask your audience relevant questions and watch your engagement soar. Video is king. Start using it! 2. Great visuals = Great social media Almost no one will stop scrolling for a huge chunk of text. But an engaging image will get you everywhere! Your Facebook page posts should have high-quality photos. People love great visuals more than they care to read. You don't have to be a design expert to create compelling visual graphics. Check out Canva.com if you are new to the design world. It's a free and simple graphic design tool website. Learn Adobe Photoshop and Illustrator at the Leadership Institute. The next Digital Creative Workshop: Design is just around the corner. 3. Posting frequency “How often should I post on Facebook?” You should post on Facebook as often as you have quality content. Just ensure your posts are spaced out at least an hour. If you have tons of content, then posting up to 15 times per day is a good thing. However, 95% of people don't have the quality content (or time) to post that much. Let your content dictate the frequency of your posting. Do your best to craft a content schedule and make it consistent. The marketplace will let you know if you're posting too much if you're getting poor engagement on your posts. If you're getting a solid number of likes, comments, and shares then try increasing how often you post. 4. BONUS: Check out the Leadership Institute's online Facebook for Activism training! If you liked the tips above, you will love this training. The Leadership Institute's Online Training: Facebook for Activism will show you how to use Facebook to build a movement around the candidate, campaign, or cause you're committed to. You will leave this training with strategies you can use to accomplish your goals, whether it's starting chapters, recruiting volunteers, building your meetings and events, or even just connecting your friends to each other. Specifically, you'll learn: how to prime your Facebook for success to activate people in your online community; best practices to create conten­t that your supporters will respond to and want to share; and a proven, five-step process to build relationships with your supporters. Learn more about Facebook for Activism here. Let me know what you think. Have you used any of the resources/tactics above? Leave a comment below. Starting a new job is among the most daunting experiences in our professional lives. After all, you only get one chance at a first impression. As well as trying to wrap your head around your new responsibilities, learn the office culture, make friends, and demonstrate your ability, you're also trying to keep your feet on the ground and build a successful future for yourself. It is natural to want to keep your head down and not draw attention to yourself, like a mouse among sleeping cats. This is a mistake! Here are five things you should do in your first week: Ask your supervisor (and employees) to lunch By asking your supervisor to lunch, you are showing your new boss that you are confident in your new role and you are serious about learning the ropes. I would advise you to keep this lunch just the two of you if possible, as other employees may dominate the conversation. It is also an effective way to get to know your supervisor on a one-to-one basis, outside of the formal office environment. It is important for them to get to know you. This is your chance to tell them what you want out of this job and where you would like to go in your career. If you're a manager, take your staff out to lunch, either in small groups, or one-to-one if possible. This is your chance to understand what makes these individuals tick, and establish what you expect from them. Introduce yourself to everybody in the office You will be spending lots of time with the people in your department and organization over the next few months and years. So be sure to take some time to introduce yourself to everybody in the kitchens, boardrooms, or even by visiting their workspace. Understanding the office culture is critical to success. You will likely need to collaborate with other departments on a multitude of projects, so make friends with them quickly to establish your relationship. Too many new employees fail to integrate themselves into the social side of a new office and get left out in the cold. Learn about all of the current and upcoming projects Fully brief yourself on all of the current projects in your department. Wherever possible, you should do your research, but do not be afraid to ask smart questions. It is in your colleagues' interests to help you succeed, as your work will affect theirs. Try to establish what other people are working on and where you can be of assistance, but also what scope you have for innovation. Every employer is different; some will let you pursue your projects, whereas others prefer a top-down approach. Learn about the location of your office Being successful at work requires you to be happy in your job, and comfortable in your environment. However moving to a new place, especially if you have moved away from home or college for the first time can make you feel isolated and unsettled. This is not conducive to success in your new job. Ensure that you learn the area quickly. Where are the best restaurants, bars, and coffee shops? What activities are happening locally? With whom in your office do you share hobbies? This will help you to settle quickly into your new environment, and even take the lead in your office's social life. Reconnect with former colleagues It is easy when you start a new job to be swept up in your new professional life. As a keen networker, try to get into the habit of keeping in touch with your old colleagues quickly. You never know when you will need a referral, or when your new job requires a connection from your past. Remember to keep those professional relationships alive. TEGUCIGALPA – Honduras is one of the few countries in Latin America with a center-right government. This week, four Leadership Institute staff and faculty members participated in an international mission observing the country's national primary elections. 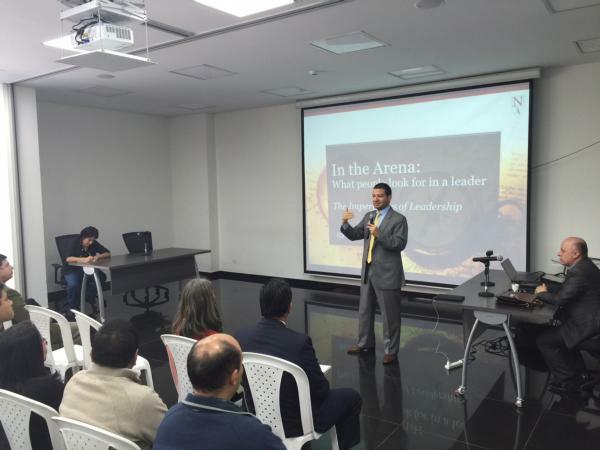 The Leadership Institute's International Department has a robust ongoing training program in Honduras. The center-right National Party is under pressure from two leftist parties, the more extreme of which, Libre, receives active support from radical left-wing regimes in the region including Venezuela, Cuba, and Nicaragua. International observation missions are an important means of ensuring transparency and accountability in internal party democracy. LI's Director of International Programs Ron Nehring, former Ohio GOP Chairman Kevin DeWine, and former party chairs Nyna Armstrong and Thaddeus Taylor, who made up the LI team, were joined by 17 observers selected from conservative parties of other Latin American countries by Germany's Konrad Adenauer Stiftung (Foundation), which sponsored the program. 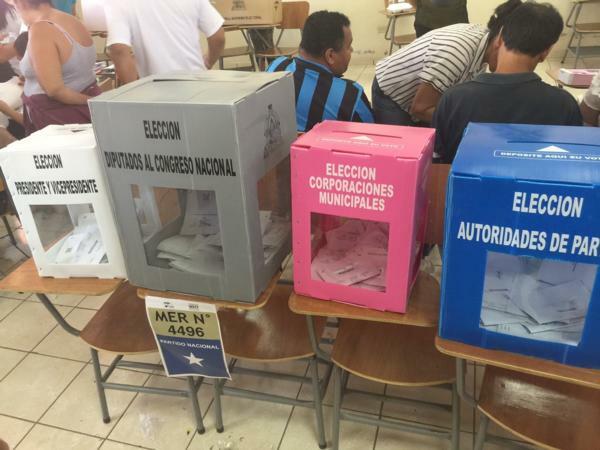 The observation team visited 4 polling places in the region of Honduras' capital of Tegucigalpa, watching and reporting on how voters received and cast their ballots in each party's primary election. The team reported the election was well organized and experienced only minor complications, such as the late arrival of observers from various party factions at some polling places. “While countries like Venezuela and Cuba rest political liberties, Honduras demonstrates a strong national commitment to allowing every citizens' voice to be heard,” said Nehring. In 2016, the Leadership Institute trained 1,058 conservative candidates, potential candidates, leaders, and activists from throughout Honduras. Click here to learn more about how you can bring an LI training to your country. With the left in control in “the Texas of Canada,” conservatives in Alberta are gearing up for a comeback. On Saturday, January 21 the Leadership Institute trained 223 activists, elected officials and future candidates with an intensive program that brought participants from throughout Alberta and as far away as Edmonton. Leadership Institute Director of International Programs Ron Nehring and expert faculty member Bill Faulk of New York led the program. They were accompanied by William McBeath of the Manning Centre. The overwhelming attendance shows a “pent-up demand for this kind of training” according to one Conservative Party leader. Participants received training in subjects including the real nature of politics and elections, campaign strategy, crisis communications, digital activism, campaign messaging, and more. The Calgary program was the second in a series of six programs the Leadership Institute is holding throughout Canada in 2016 and 2017. Future programs are already on the books for Halifax, Toronto, and Ottawa. Click here to learn more about how you can bring an LI training to your country. It's been said that big business loves big government, and this maxim certainly holds true in Latin America where Leadership Institute faculty member Italo Antoniotti is fighting to reform Guatemala's outdated and destructive coffee and trade laws -- helping tens of thousand of indigenous Mayans in the process. Antoniotti serves as the director of FEDECOCAGUA, the voluntary national association representing 23,000 small coffee producers in Guatemala, most of whom are native Mayans. They're going up against the country's biggest coffee producers and their government-guaranteed supermajority on the board of Guatemala's state-sanctioned coffee trade association, ANACAFE. The small producers represented by Antoniotti's group are forced to obtain export licenses from the big coffee producers that dominate ANACAFE, and pay a mandatory (and economically inefficient) 1% export tax to fund the organization. This year, FEDECOCAGUA went to court to challenge the constitutionality of the export tax and the regulatory system that requires small coffee producers to, in effect, obtain the permission of their larger competitors for the freedom to sell their goods on the world market. With a tiny domestic coffee market, producers' financial success or failure depends entirely on their freedom to export. With a 30% decline in Guatemala's coffee production during the last decade, it's economic crunch time for the country's indigenous population of coffee producers who rely on selling their product to sustain their families and communities. Antoniotti, who began serving as a Leadership Institute volunteer expert faculty member in Latin America this year, argues that the free market, and not government mandates, should prevail. Industry trade associations should be voluntary and not government-mandated, and the export tax should be abolished as economists universally recognize the inherently destructive nature of export taxes. (Article 1, Section 9 of the United States Constitution explicitly prohibits such taxes.) In many Central American countries people have been forced to choose between socialist policies on the one side, the crony capitalist policies on the other. The solution, as documented extensively by the Heritage Foundation in their Index of Economic Freedom, is to advance policies that give neither government nor government-favored businesses an unfair advantage in the marketplace. Reasonable and predictable taxes, free trade, freedom from corruption, access to a fair judicial system, a low regulatory burden and free labor markets are the keys to economic success and prosperity. If Antoniotti and his group of 23,000 independent coffee producers succeed, one Central American country will have taken a significant step in the right direction. The key to winning an election is much more than simply turning out more voters than your opponent. You must learn the techniques that successful campaigns have been using for years, and then adapt them to fit your winning formula.A successful door-to-door effort could be the difference you need to win! Voter registration is as important as volunteers and fundraising for a campaign. You can't win if you don't have the votes. Learn how to find unregistered voters and why a successful voter registration drive can lead to victory. Missed last night's webinar? No problem -- watch it whenever you have time today or this weekend.You'll hear from Linwood Bragan on campaign structure and organization. Linwood began his political life in 1972. His campaign experience covers management, operations, finance, and grassroots. Twice he has been a candidate himself. He has lectured in 20 states on political activism, finance, organization and elections from New England to the Rockies and the Great Lakes to the Gulf Coast.You can register right now for next week's webinar: determining voter goals, which will be held live on Wednesday, August 15 at 7pm EST.